Upper and lower pillars produced by Venus. 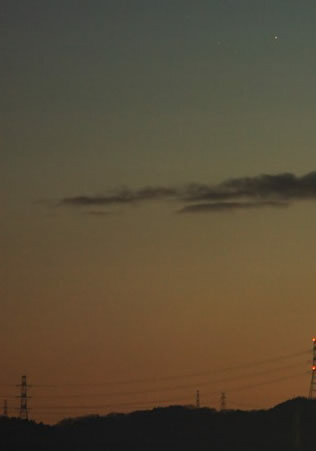 Shinya Ueda imaged this pillared Venus at dawn on 11th January 2005 from Osaka, Japan. Mercury is 0.5º to the right of Venus allowing us to gauge the total height of the pillars as about 0.4º. Mercury (magnitude -0.3) was 20X less bright than Venus which accounts for why its pillar was too faint to show in the photograph. ©2005 Shinya Ueda, shown with permission. A pillar produced by a planet is a rare event. To see one, first find a clear horizon so that the planet can be seen when only a few degrees high and when the sun is preferably well below the horizon. A thin layer of cirrus cloud is needed - perhaps previously indicated by sundogs or a sun pillar at sunset. 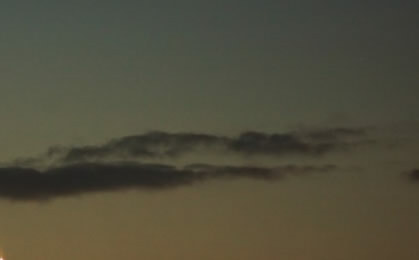 Search for a Venus pillar with low power binoculars - but never when the sun is visible. Move the binoculars to and fro slightly because faint and diffuse glows then show up better. Be wary of false sightings caused by lens reflections! 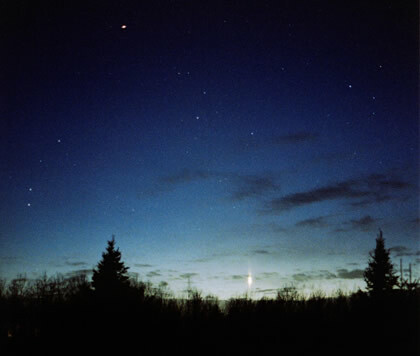 Venus on 9th April 2002 imaged by Carol Lakomiak of Wisconsin. Carol was photographing Comet Ikeya-Zhang when she noticed that Venus looked odd. "Without optical aid, I saw beams of light coming from the top and the bottom of the planet. They were more pronounced through 11x70 binoculars. I turned the camera to the west and began to take photos ... "
This 15s, 50mm exposure might well be the first ever image of a "Venus Pillar". Image©2002 Carol Lakomiak, reproduced with permission.